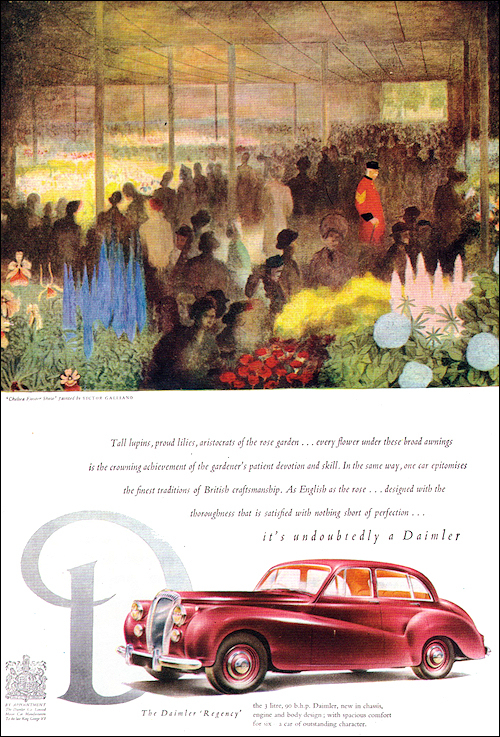 Daimler Regency Saloon was announced at the London Motor Show in October 1951. 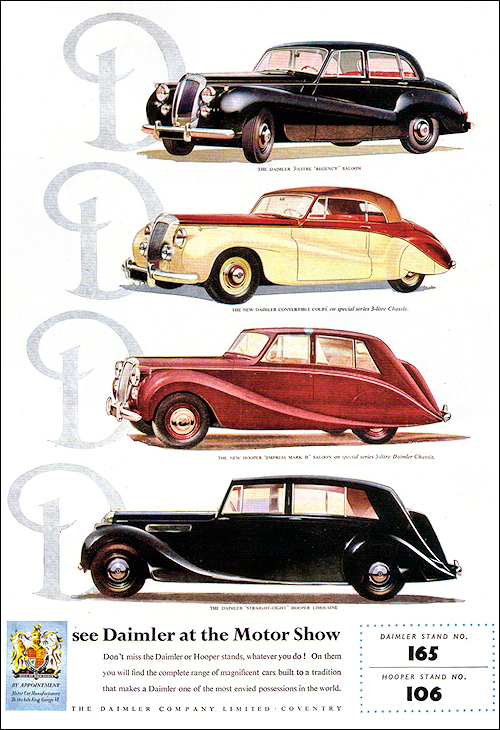 It is a 90-bhp 3-litre-engined, luxury four-door model with modern lines but nevertheless traditionally very much a Daimler. It is built primarily as a result of the strong overseas demand for a large capacity car with good ground clearance, plus six-seater accommodation well hidden by graceful body styling. 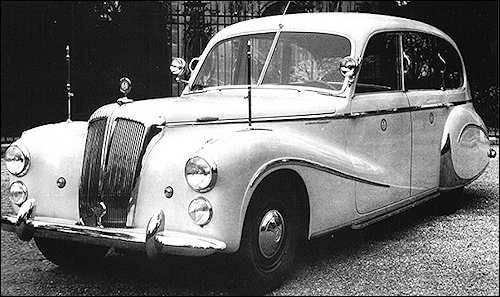 An open version of the Regency chassis called Sports Special Convertible Coupé was launched by the end of the year. Extra power comes from a new, alloy cylinder head. The gearbox is quite unusual with the 4-th gear being an overdrive. The hood, windows and boot lid are electrically operated. 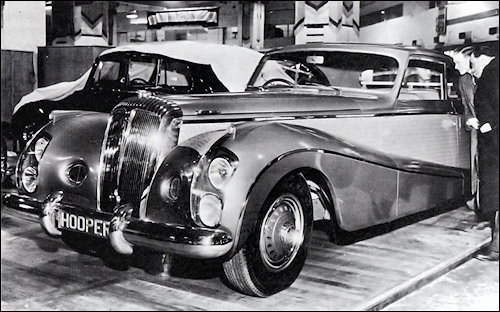 Another 'Dockers Daimler' was shown at Hooper stand at Earls Court. The 'Blue Clover' finished in two tones of blue with tiny four-leaf clovers on side panels. 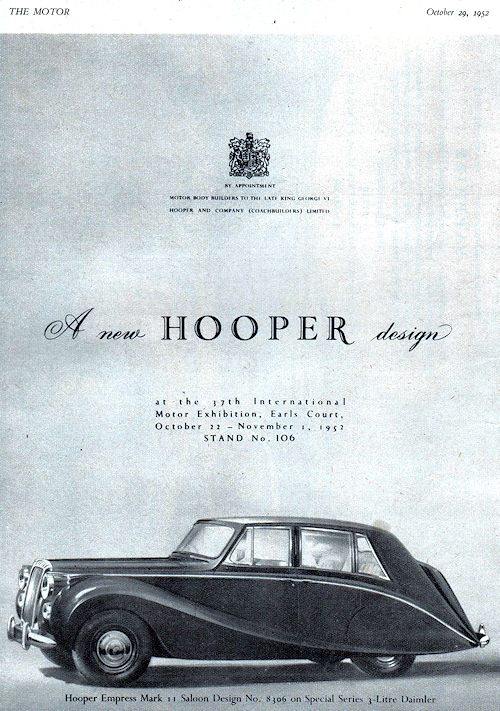 As the first of the series, the 'Green Goddess' of 1948, it has 3 front and 2 rear seats covered in lavender blue leather with contrasting, dark blue piping. The steering wheel and interior details are finished in blue lizard-skin. Two cabinets on each side of the rear seats contains cut glass flasks and glasses, sliver Thermos jugs, sandwich boxes, cups and saucers and linnen. In the recesses above the rear seats are 8 mm cine-camera and fiel-glasses. The side windows are double-glazed and electrically operated, the curved windscreen has heat-reflecting Triplex glass. 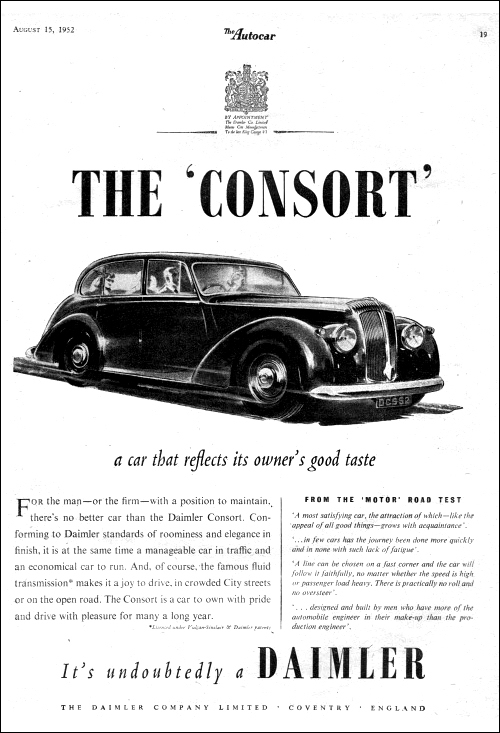 Consort 6 cyl. 2522 cc 70 bhp wb: 9ft.6in. DB 18 Sports Special 6 cyl. 2522 cc 85 bhp wb: 9ft.6in. Saloon 6 cyl. 2952 cc 90 bhp wb: 9ft. 6in. 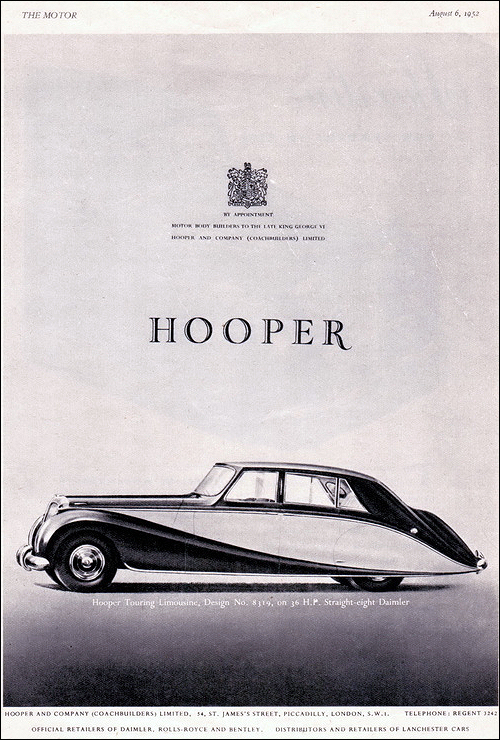 3-Litre Convertible Coupé, a Barker-bodied, two-door luxury model built on the 2952-cc Regency chassis. Engine performance is increased by the use of an aluminium cylinder head and a higher compression ratio which pushes its output up to 100 bhp at 4200 rpm. Features of this model includes twin fuel tanksone beneath each rear wing and power-operated top, windows and luggage boot lid. 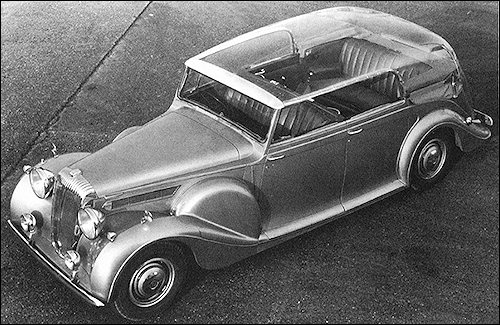 Although following the same general lines of construction as the Daimler Regency introduced in 1951, the new 3-litre Daimler convertible embodies certain mechanical modifications and is fitted with a wholly new type of body. Partly by reason of an increased compression ratio (7.5 : 1) the engine develops 100 b.h.p. at 4,400 r.p.m. as compared with 90 b.h.p. at 4,100 r.p.m. 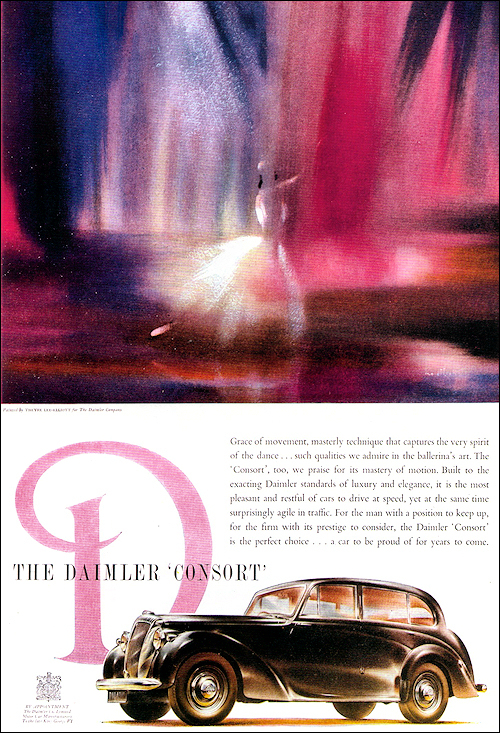 on the Regency model, and although the Daimler transmission system is used, the fluid flywheel in this case drives an epicyclic box giving a direct power line to the rear axle on third gear which is 4.89 : 1, fourth speed being an indirect overdrive with a rate of 3.46: 1. The body is of two-door type, which gives full accommodation for four passengers, there being individual front seats with armrests on each side. The folding head is power-operated and folds over snugly behind the rear seat. Both side windows and the rear quarter light can be put down out of sight and the car can thus be used as a four-seater open tourer or closed car at will. In the closed position better than usual visibility is provided, the rear window being of considerable size and front screen of great width with curved glass. The front windows incidentally have push button control; the facia panel is in walnut and the steering column adjustable for length. A large luggage locker is provided with a filler cap on each side of the car. DE 36 8 cyl. 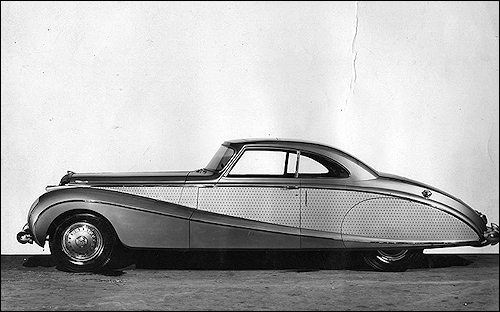 5460 cc 150 bhp wb: 12ft.3in. The 'Blue Clover' at Earls Court. 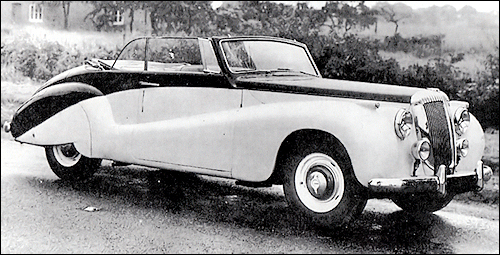 Royal Daimler All-Weather Straight-Eight on tour in Australia.